7 We've Carried The Rich For 240 Years! Let's Get Them Off Our Backs! Carl Davidson is a Pennsylvania based activist and member of the National Committee of the Committees of Correspondence for Democracy and Socialism. He is the father of Laurie Davidson, and the partner of Alynne Romo. Carl Davidson is a veteran peace and justice organizer, a LeftRoots Compa, and a Democratic Socialists of America member. In the 1960s, he was a leader of the New Left, twice elected as a national leader of Students for a Democratic Society, a Mississippi Freedom Marcher, and a writer and editor for the Guardian newspaper. He now lives where he was born, in Beaver County, Western Pennsylvania. Carl Davidson grew up in the small town of Alaquippe, Pennsylvania. Davidson participated in the Mississippi Freedom March. Davidson was an early leader of Students for a Democratic Society (SDS). He served first as an organizer for a year on the Great Plains, then from 1966 to 1968 as SDS Vice president and International Secretary. The very first demonstration Davidson attended was a 'Hands Off Cuba' vigil of twelve students at Penn State during the Cuba missile crisis. Later, representing Students for a Democratic Society, Davidson had a chance to meet with Fidel. At the Cultural Congress of Havana in 1968, Dave Dellinger, Tom Hayden and Davidson were whisked away to a safe house, were they "sat up with Fidel late into the night, discussing everything under the sun". He wanted to know our opinion of McGovern, Dellinger wanted to know about Che Guevara and Regis Debray, Hayden and I asked to start what became the Venceremos Brigade, and Fidel bugged me to explain 'hippies' to him, and I tried my best. He is a remarkable man, with a photographic memory, wide knowledge and keen insights. Cuba will change after him, though, as brother Raul is already looking into the socialist market economy in China and Vietnam, but will undoubtedly make any reforms 'in the Cuban way.' We should all wish Fidel and Cuba well, and double our voices against the blockcade. Carl Davidson was a New York delegate to the October League's December 1975 "National Fight Back Conference" in Chicago. Davidson was a staff writer for the Maoist publication The Guardian. He was also involved in the Communist Party USA (Marxist-Leninist) and the League of Revolutionary Struggle. Carl Davidson was the editor of Class Struggle, CPML’s theoretical journal, and a member of the Standing Committee of the CPML. We've Carried The Rich For 240 Years! Let's Get Them Off Our Backs! We've Carried The Rich For 240 Years! Let's Get Them Off Our Backs! 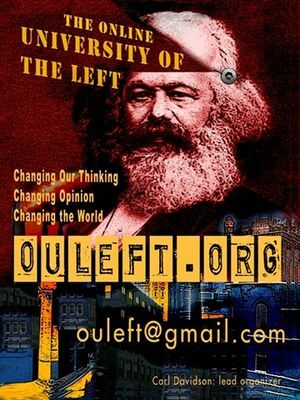 is the name of a 2016 Facebook group for folk to exchange views and memories of the Revolutionary Union/Revolutionary Communist Party/Revolutionary Workers Headquarters lineage of the '70s New Communist Movement. In the early 1980s Anne Adams, Carl Davidson and Michael Lee were co-editors of Forward, the magazine of the League of Revolutionary Struggle. In 1989 Regional Correspondents for Unity, newspaper of the League of Revolutionary Struggle included Carl Davidson, Chicago. Carl Davidson on the Rainbow Coalition. I worked both of Jesse’s campaigns as an LRS member. In Chicago, my cell did this by putting together ‘Peace Voters for Jesse’ fundraisers in neighborhoods with a lot of white progressives. We did OK. I also worked with Merle Hansen of the North American Farm Alliance in mass meetings in Iowa to bring in the ‘Green’ stripe of the rainbow in all-white areas. That worked too. I had a birds-eye view on why everything collapsed at the end. I don’t blame it on Jesse. He often told us his job was to shake the cherry tree, while our job was to gather the harvest. Why did we fail to bring in the harvest? Because we were ‘building a movement’ when we needed to be ‘building organizations.’ Of course, there is a dynamic between the two. But we don’t need to build movements. The abuses of capitalism do that, in regular waves. Riding the waves, we need to know how to cast the net out, and how to pull it in, meaning into new organizations, so when the next wave comes for us to ride, we have an even stronger means to cast out and draw in. And so on, until we have a new Modern Prince to bring in a new order. In 1994 Carl Davidson, Chicago was listed on a "Membership, Subscription and Mailing List" for the Chicago Committees of Correspondence, an offshoot of the Communist Party USA. In July 1994 Davidson (Chicago) was electedto the 15 member National Co-ordinating Committee of Committees of Correspondence at CoC's founding conference in Chicago. In 1997 Carl Davidson served on the National Co-Ordinating Committee of the Committees of Correspondence. In 1988 Carl Davidson and an old friend, Ivan Handler, formed Networking for Democracy. "I dreamed it up while on a long drive through Kansas, selling bumpers," he says. "It kind of went back to the old stuff we did for SDS with our working-class manifestos, only putting aside the old dogmas and looking at the world with a fresher perspective. Basically, we want to prepare the working class for the next wave of technology, even if it means jobs are lost in the meantime." In 1993, a year after the Guardian closed its doors, Carl Davidson published, along with co-author Jerry Harris, history professor at DeVry University in Chicago, and Ivan Handler, Chief Information Officer (CIO) of the State of Illinois Department of Healthcare and Family Services, a new manifesto, "The Promise and Peril of the Third Wave: Socialism and Democracy for the 21st Century." The Chicago Third Wave Study Group, initiated by Carl Davidson, Ivan Handler and Jerry Harris. It was formed expressly to produce this document for the discussion on goals and principles taking place in the Committees of Correspondence, leading up to the founding convention of a new organization of the American left in the summer of 1994. In the mid 1990s Carl Davidson was leading activist in the Chicago New Party, where he worked closely with New Party member and candidate Barack Obama. Carl Davidson was one of several Chicago area residents, including Don Rose, Marilyn Katz and James Weinstein, who first came together as Chicagoans Against War in Iraq in September 2002 to campaign against the war in Iraq. 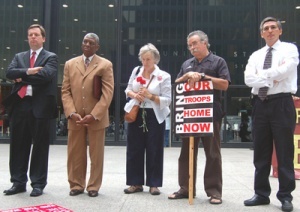 In June 2003, they changed their name to Chicagoans Against War and Injustice. 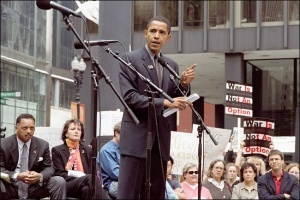 On October 2 2002 Chicagoans Against War in Iraq organized the famous anti war rally in Federal Plaza Chicago, where Illininois State Senator Barack Obama made his name as a strong opponent of the war. Some of the people around Davidson, later held a fundraiser for Obama when he ran for U.S. Senate in 2004. Bill Ayers, Carl Davidson and Mike Klonsky all linked to the Committees of Correspondence list mentioned above. The three former Students for a Democratic Society leaders have remained friends through the years, despite belonging to different political factions. Bill and Mike and I have been friends since the SDS days of the 1960s--although Mike and I bitterly opposed the Weatherunderground nonsense back then when it counted. All that is well known to those who care about such things. What's silly is the notion that any of us shape the politics of Barack Obama. In 2008 Carl Davidson of Progressives for Obama, Aliquippa, PA signed an online petition “A Open Letter to Barack Obama on Iran”. In 2009 Davidson was listedas a signer of the Progressives for Obama website-SolidarityEconomy.Net. Carl Davidson attended the 6th National Convention of the Committees of Correspondence for Democracy and Socialism (CCDS) at San Francisco's Whitcomb Hotel July 23-26 2009. Davidson, of Pennsylvania was electedone of four new CCDS co-chairs. In 2010 Carl Davidson was listed as a contributor to the Movement for a Democratic Society linked, Austin Texas based, The Rag Blog website. In June 2010, groups from all over the country in Detroit for the U.S. Social Forum. They presented over 1000 workshops on topics as diverse as American foreign policy, the economic crisis, global warming, and trade unionism. Democratic Socialists of America presented five workshops, including "Socialism is the Alternative" — DSA members Joseph Schwartz and David Schweickart, Communist Party USA representative Libero Della Piana, Committees of Correspondence representative Carl Davidson, and Freedom Road Socialist Organization representative Eric See discussed a vision for 21st century socialism, why it is still relevant, and how we can promote unity among socialist organizations. The room for this workshop had to be expanded to accommodate the large audience. 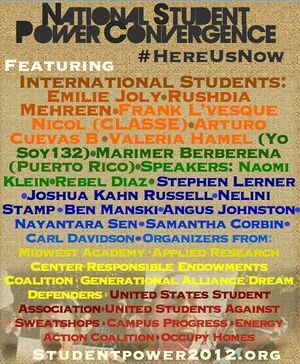 Speakers at the National Student Power Convergence 2012 included Naomi Klein, Rebel Diaz, Stephen Lerner, Joshua Kahn Russell, Nelini Stamp, Ben Manski, Angus Johnston, Nayantara Sen, Samantha Corbin, Carl Davidson. Pittsburgh DSA shared Beaver County Peace Links's event. Join Beaver County Peace Links for a discussion about the anti-war movement in the Trump era at the Community College of Beaver County at 1 PM on Saturday, April 22! The event will feature Michael McPhearson, Executive Director of Veterans for Peace, and Kevin Martin, Executive Director of Peace Action. Also present will be Janet Tucker and Carl Davidson who are building a DSA chapter that represents Lawrence, Mercer, and Beaver Counties in Pennsylvania as well as the Youngstown region, so this is a great opportunity for local radicals to meet and discuss opportunities for DSA coalition building in the upper Ohio Valley. Later that month the Steel Valley Democratic Socialists of America Organizing Committee went public. Carl Davidson, supported the Democratic Socialists of America Unity grouping, established for the 2017 Democratic Socialists of America National Convention in Chicago. The Left and the 2018 Elections: high stakes for the country, Committees of Correspondence for Democracy and Socialism Education Project Webinar: May 21, 9pm edt. Many on the Left will actively engage the 2018 elections. The stakes are high: it is imperative to defeat right-wing Republications to stop the extremist attacks on working people. And, as public opinion sours on Trump, there are many opportunities to elect progressives both nationally and locally, and pass state ballot initiatives. The new progressive formations that emerged to resist the far-right Republican government show growing potential. How do democratic socialists become involved? More than 150 academics specializing in Global Students, as well as a number of political activists, gathered at Howard University June 6-8, 2018 to share papers, research and ideas. The overall theme was 'Globalization, Race and the New Nationalism'. It was the 17th year the GSA has met, and the organization now has about 2000 members in North America and the Caribbean. A major keynote featured William I. Robinson from the University of California at Santa Barbara, and Jamala Rogers of the Organization for Black Struggle in St. Louis, Mo. Robinson discussed how globalization was bringing new forms of fascism into being, while Rogers presented her new book summarizing the lessons of the Ferguson rebellion. CCDS organized a workshop entitled 'On Multi-Racial/Multi-National Unity: Theory and Practice,' where Harry Targ, Ira Grupper, Valeria Sinclair Chapman, and Carl Davidson made presentations. Carl Davidson, a founder of the GSA, spoke at the closing plenary, presenting his 'US Six-Party System Thesis 3.0' paper. This page was last modified on 14 December 2018, at 17:53.